You can fill your Mailbox with memories or with your partner’s favourite sweets. This versatile design is perfect to fit a range of needs, plus it’s really cute! 1.Log in to the Cricut design space UK, scroll down the home page until you find the mailbox project. Click on the project. 2.Read the list of supplies needed and the notes about the project. Then click on make it now. 3.Use the First edition Love story 12x12 paper pad to cut out the project, follow the steps on the Cricut design space to cut out all of the elements needed. 4.Click on the online digital handbook link, follow the instructions to make the mailbox. You will need the Cricut Tools Scoring Stylus to score along the designated lines. 5.Make sure to use a strong adhesive like the Dovecraft Perma-Fix double sided tape when assembling the box, as this will ensure that all the elements will be stuck together securely. 6.Cut out one of the tags from the Love story paper pad. Wrap twine around the centre of the mailbox and attach the tag to this. Adhere the tag to the mailbox, with foam pads to add dimension. 7.Adhere the hearts to the mailbox, Maxine has cut out extra hearts to decorate her mailbox. 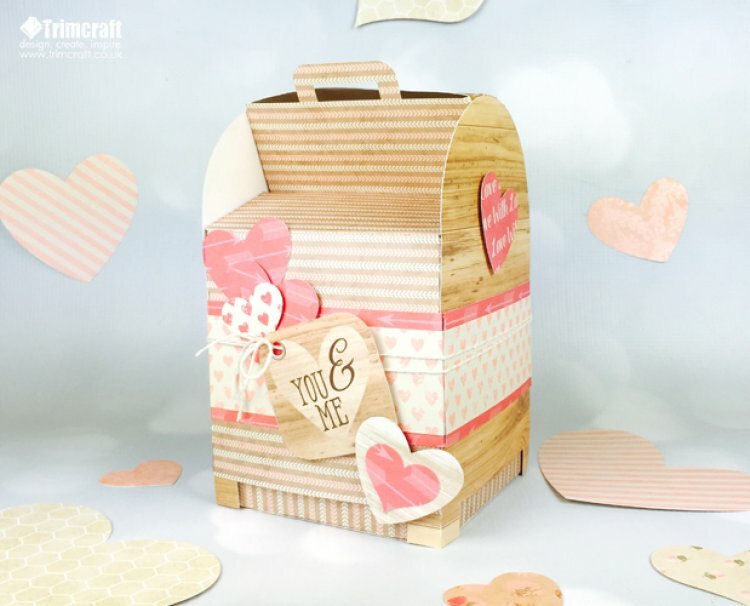 8.Cut out some larger hearts to write a secret message on, to post in the mailbox. TIP: This is a great opportunity to write your memories down of your time together and to continue doing so throughout the year! Small photos would also be a nice addition to your keepsake box. What a simple design for such an effective make! Reuse the box design and use a different paper collection for upcoming occasions like Mothers day and Easter. We love seeing your versions, make sure to upload your brilliant boxes to the project gallery. My second entry for the April sketch challenge.